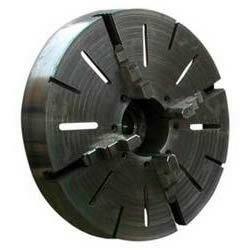 We are recognized as one stupendous Independent Dog Chucks Manufacturers and Suppliers in India. Various national as well as international clients are placing bulk orders for the Dog Chucks due to the unmatched quality and unsurpassable performance in respective applications. The use of optimum quality materials in the manufacturing of the Dog Chucks ensures high durability, tensile strength and resistivity to adverse conditions. Dog Chucks are available ranging from 8" to 72". Additionally, customers are eased with the availability of the 4 Jaw Dog Chucks and 6 Jaws Dog Chucks above 36".